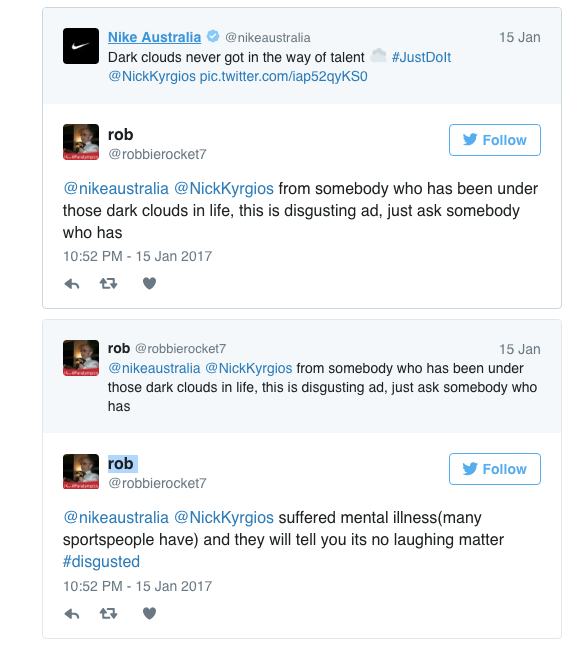 A new ad by Nike featuring Australian tennis player Nick Kyrgios has been attacked for making light of people with mental health issues. The ad shows the troubled tennis player surrounded by animated dark clouds and lightning and comes with the strap line “Dark clouds never got in the way of talent”. Kyrgios, famed for his outbursts and poor behaviour on court, was bundled out of the Australian Open last night by Italian Andreas Seppi who is ranked 152 in the world (Kyrgios is ranked 13th). 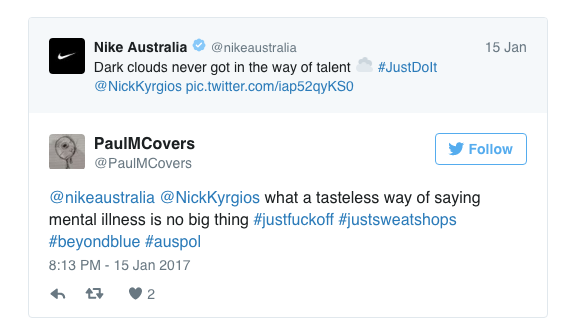 Kyrgios blew a two set lead to go out with his typical tantrums and racquet smashing. However, it was the “dark clouds” comment that raised many people’s ire as it appeared to make light of people with depression and mental health issues.